Golfers at the golf course. A wide-angle lens if you’re planning on taking any from above the village. It gets quite windy up there, so a sturdy tripod. Suitable footwear for the beach in all weathers. 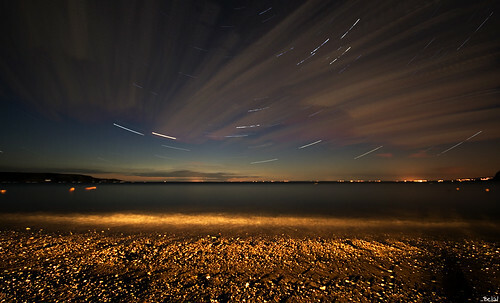 Best times to go there. There’s not really a “best” time for Porth Dinllaen, you can get something good out of a photoshoot no matter what the weather’s throwing at you. Dark clouds can look good if you’re taking shots from above the hamlet from the golf course. Sunny days brings out a lot of golfers onto the golf course and more boats to the harbour.. You can get some lovely colour in the sea on a bright, still day as well. 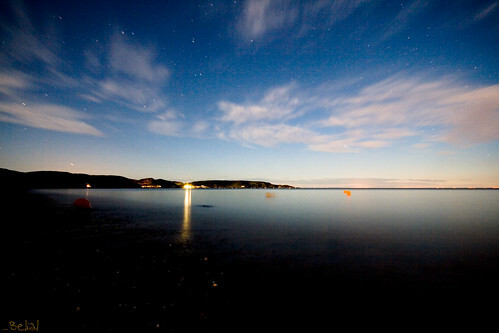 I’m always a fan of night shots, and Porth Dinllaen doesn’t dissapoint, at night it’s magical to watch the moon reflected on the water, and the stars (again wide-angle a bonus here) above the landscape is superb. There’s a particular shot i’ve still not managed to capture which i’m 100% happy with yet, and that’s at night, with a wide-angle, and capturing the sea on both sides properly. I think I may need a step-ladder with me for it as I think you need the camera to be about 7ft up in the air to really capture it properly. There is a lovely walk along from the village which will take you along the headland towards the lifeboat station, in heavy weather or high tides it’s not recommended for children as it can get very slippery there, but it does get you really close to the sea and for some lovely views across the bay towards The Rivals. But on summery days, it’s a wonderful little walk that takes you down to the coast and along a very old footpath as you can see below. There is also a very good (so i’m told, I don’t play golf :p) golf course up at the top overlooking the village too. Which can offer some great opportunities for some sports shots, and even just watching the wildlife (there are lots of Seals around the whole bay at the right time of year). 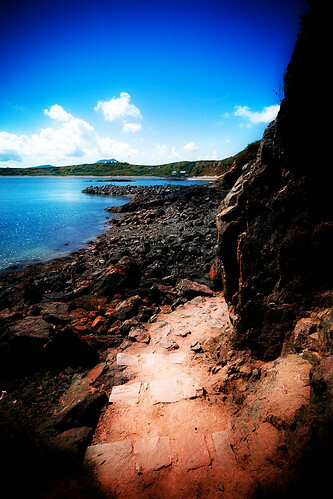 If you’re coming down from the direction of Morfa Nefyn, there are several large rock-pools along the path too, great for both keeping the children amused and gives you a great view of the village at the bottom of the hill too. 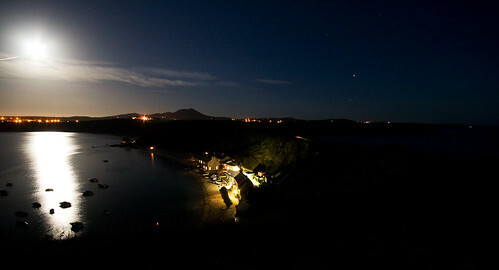 You can also get some lovely views at night by starting your journey from Morfa Nefyn as all the big towns (well relativley speaking) are behind you, you won’t get too much pollution in the sky as you look towards the hamlet. And after all your hard work walking around the coastline, there’s a delightful pub called “Y Ty Coch” in the hamlet, I can recommend getting yourself a drink and sitting on the wall outside to take in the atmosphere. 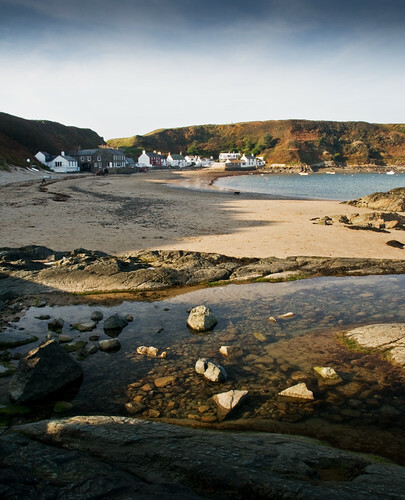 Porthdinllaen was originally a fishing port, based around a natural harbour over a mile and a quarter across, and with over one hundred acres of safe anchorage. 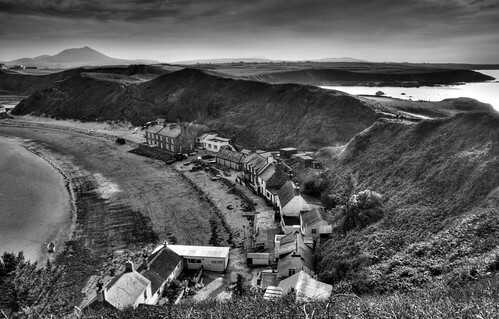 The harbour is sheltered from all but a north-easterly wind, and as the only such haven on the Llyn Peninsula, it has been used for many centuries of trading, and a place to run to for shelter in a storm. in 1808 in preparation by the Jones Parry family of the Madryn estate (the companies assets included the village and the harbour), but the bill before Parliament to constitute Porthdinllaen as a harbour for Irish trade was rejected in 1810.
imported large quantities of salt to create the Nefyn herring. 1845 – The Worcester and Porth-Dynllaen Railway informed the Rev. There is a small car park right above the hamlet (you have to drive through the golf course) but it is small, with room for only a handful of cars. It is also possible to park in the golf club car park and walk through the course yourself. 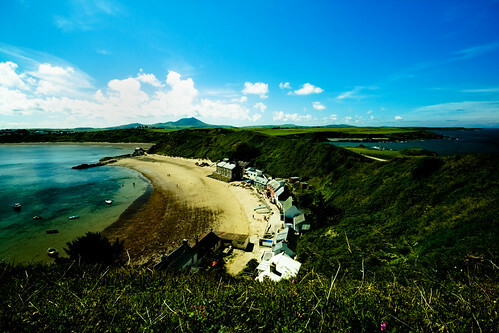 If you are approaching from the direction of Morfa Nefyn, you can either drive down the road to the beach at Morfa Nefyn, or make use of the National Trust car park and again walk along the beach. The beach walk is a lovely walk at any time of day, and takes you past some old fishing buildings and along the cliff face to Porthdinllaen. If you’re using a sat-nav system the postcode to the hamlet is LL53 6DB. Otherwise, follow the A499 towards Pwllheli. As you approach Llanalhearn you’ll notice a turning to the right (although at the time of writing this is being changed into a roundabout) signposted for Nefyn and Nant Gwrtheyrn (Welsh Language Centre). Follow this road, to nefyn and then take the B4417 through to Morfa Nefyn. There are various sign-posts in Morfa Nefyn for Porth Dinllaen, but failing that follow signs for golf-course, or “Beach” and you can park in either of those places. The National Trust car-park is on the right as you drive towards the golf course.